The next three blogs show you different ways to cook quinoa. 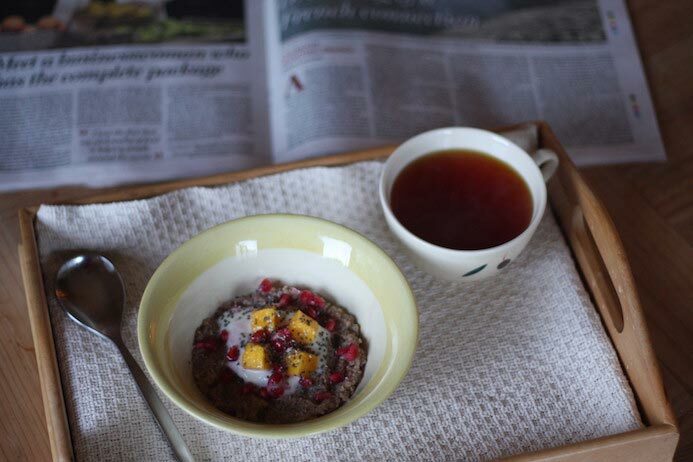 Here’s a really simple and tasty quinoa porridge recipe. Did you know that 2013 was the International Year of Quinoa? Therefore, with a whole year dedicated to this superfood, there is no time like the present to learn more about this seed and how to incorporate it into our meals. Let us start with learning how to pronounce it first, repeat after me keen-wah! I first came across quinoa when I was travelling around Bolivia. Quinoa grows in the Andean countries and has been a staple part of Andean diets since pre-Inca times. It is a seed but is used and cooked the same way as rice. It is just as versatile as rice but much more nutritious and, in my opinion, much more delicious. Quinoa is naturally gluten free and is a complete protein. This means it contains all nine of the essential amino acids. We need to get these essential amino acids from our diet as our bodies cannot make them. Quinoa really is a super food. Like most seeds, quinoa has a bitter coating, which protects it from being eaten by birds and other animals, so it needs to be rinsed well to remove its bitter taste. Once rinsed, you prepare quinoa in the same way as rice, pasta, potatoes, couscous, etc. See what I mean by it being versatile? Quinoa can also be roasted and made into flour or fermented and made into alcohol like they do in South America. However, for everyday use in your home, the best method of cooking quinoa is to toast it lightly in a dry pan, which brings out its nutty flavour, before bringing it to a boil then simmering in liquid for about twenty minutes. You can cook quinoa in any liquid you wish, for example; milk, water, or stock at a ratio of one part quinoa to five parts liquid. So now you know a little about the stuff, I am going to give you some ideas as to how you can enjoy it any time of the day. Over the next few days I will post a recipe, one for breakfast, one for lunch and one for dinner, which uses quinoa as the main ingredient. I hope these will encourage you to throw a packet of quinoa into your shopping trolley and try it out for yourself. Nearly every major supermarket stocks quinoa now usually alongside other ‘healthy’ foods, such as lentils and dried pulses. I am telling you, you will be impressed with its versatility and how it can transform your everyday meals into something new and extra tasty as well as being extremely nutritious and good for you. So go on, what are you waiting for? Whilst in Bolivia, I did as the locals did and had quinoa for my breakfast. I prepared and cooked it the same way as I would my regular oat porridge. 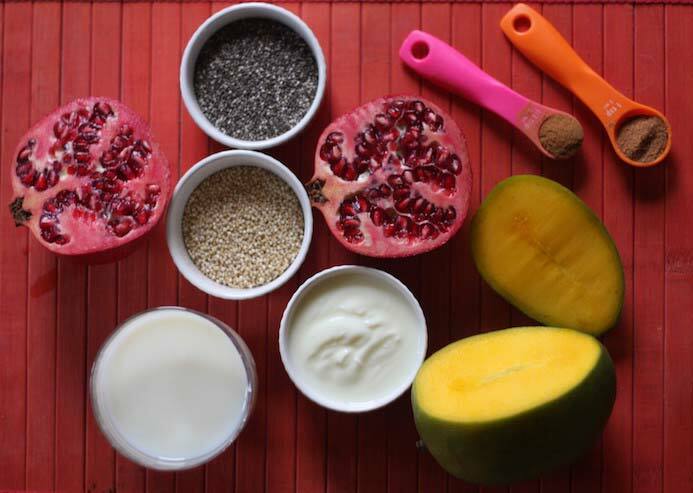 I would cook the quinoa in milk, add some cinnamon, serve with a dollop of yogurt, and top with local exotic fruits, mango and pomegranate being my favourites. 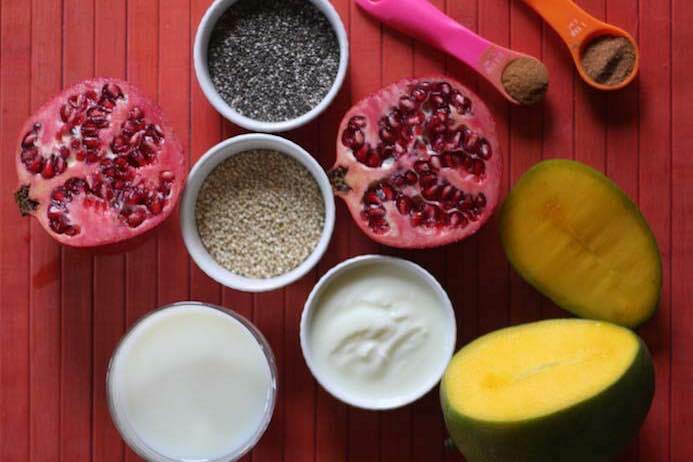 This made an extremely healthy and filling breakfast that provided lots of energy for hiking and trekking. Now, it gives me lots of energy to sit staring at my computer screen all day! Oh, how my life has changed. Place the quinoa in a sieve and rinse well under cold running water. 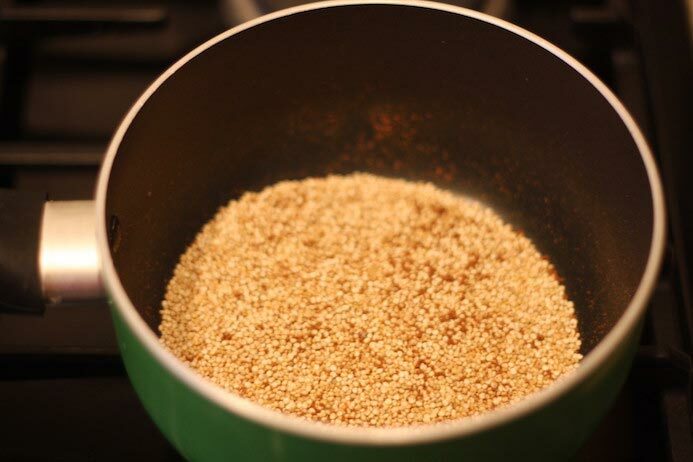 Place the rinsed quinoa in a saucepan over a low heat and add the spices. Toast for a few minutes to release the nutty flavour. Pour in your liquid of choice, milk is always good for porridge. If you like your porridge sweet, add some sugar or maple syrup at this stage. Bring to a boil then reduce the heat and allow to gently simmer for 20 minutes or until all the liquid is absorbed and the quinoa is soft and creamy. Serve up with whatever combination of toppings you like, try it with nuts and berries, or cinnamon and stewed apple or even plain, as the quinoa is tasty enough to have on its own. Straightforward enough, no? You can even make it the night before and just reheat in the microwave or with a little more liquid on the hob in the morning. You are getting a big whack of protein in the meal and if you serve it with Greek yoghurt you are getting even more protein, what an epic way to start the day. Great as a pre- or posting training meal. What more could you want? 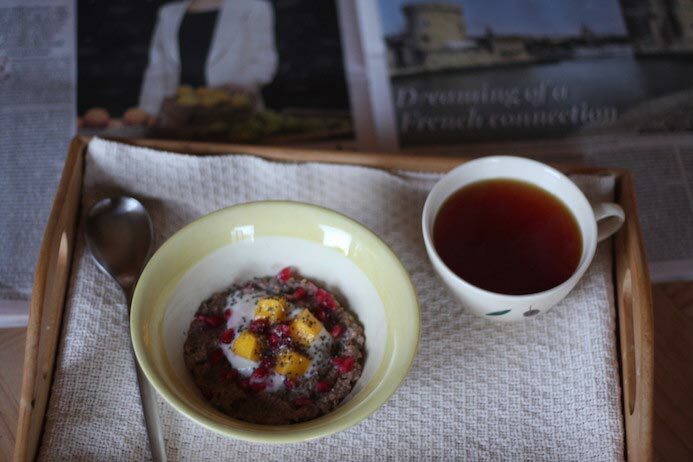 So, what do you think of my quinoa porridge recipe? Did you try it out? Did you like it? What improvements would you make? Share a photo of your own attempt at this recipe or leave any feedback and comments below, I’d love to hear from you. If you like this recipe, please share with others. Yum! I love quinoa. This is a great alternative to boring oats! It really does make a nice change and even though it is still quite filling I don’t find quinoa porridge as heavy as oats.